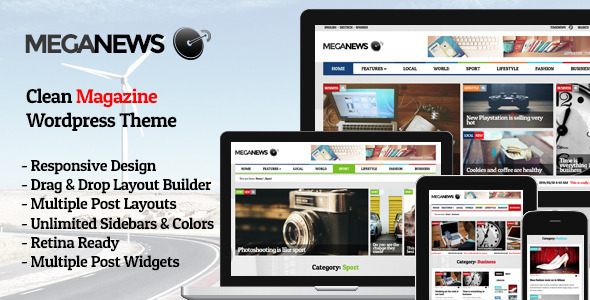 Meganews is a Responsive Magazine WordPress Theme with Layout Builder. WordPress Theme Meganews is a Responsive Magazine WordPress Theme with many features: easy to use Layout Builder (Visual Composer), on-click Theme Options, Resposnive design, unlimited layouts, unlimited colors, different post layouts, many useful shortcodes integrated into the Visual Composer and much more. The main feature is a strong Layout Builder (Visual Composer) which offers you to create wonderful, unique layouts with just clicks. Theme is also SEO friendly.